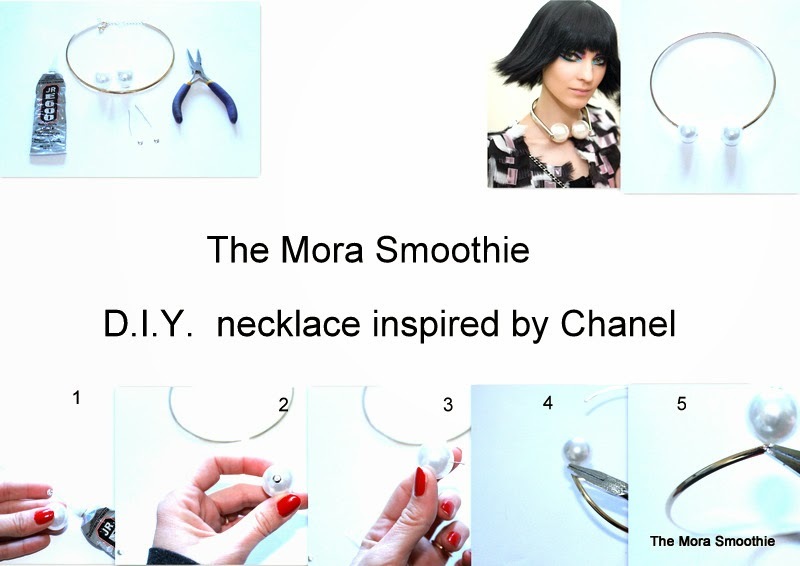 The Mora Smoothie fashion blog, DIY fashion by Paola Buonacara: DIY Necklace inspired by Chanel! Today a new D.I.Y. ! Who guess? No way but it is too easy, the necklace with maxi pearls inspired by Chanel! I'm in love with this necklace so much that I also had to wear the modelsvduting a photo-shooting, but I will talk about later, now back to our tutorial. Essential: rigid necklace by Stradivarius (or even quite double golden wire, but for convenience I used this already in shape and cute), big pearls, tacks for pearl and supporting pearls, and a little glue. Tutorial: I first removed the chain from my basic necklace and then I just added the supports for pearls and the tack in the maxi pearls, stopped with a bit of glue and finally I hooked helping me with a pair of pliers to the holes of the necklace. "Et voilà" my necklace is ready, what do you think about? PS: If you make it do not hesitate to let me know and maybe send me your pics. Chi indovina? Ma si dai è troppo facile, la collana con maxi perle ispirata a Chanel! Sono innamorata di questa collana a tal punto che l'ho anche fatta indossare a delle modelle, ma di questo vi parlerò più avanti, torniamo al nostro tutorial. Necessario: collana rigida by Stradivarius (o anche del filo oro abbastanza doppio, ma io per comodità ho usato questa già in forma e carina), maxi perle, chiodini per perle e appoggia perle, ed un pò di colla. Tutorial: ho prima tolto la catena alla mia collana di base e poi ho semplicemente inserito l'appoggia perla e il chiodino nelle maxi perle, fermato con un pò di colla ed infine l'ho agganciato aiutandomi con una pinza ai fori della collana. Et voilà la mia collana è pronta, che ne dite? PS: se la fate non esitate a farmelo sapere e magari mandarmi le vostre foto. good we are going to share everything about how to download videoder in your pc. I found this guide There are some most things which people can get from this application. Download Videoder App great. good ranges of functions for the users which will certainly profit mobdro for android After mount Mobdro app on pc appropriately, Mobdro symbol will great. engineers chronograph rolex uk special section wanton nations living in run time - the fake watches Engineer Chronograph special section These three watchess combine the design and strength of the car, the appearance is replica watch also very retro style, it is easy to distinguish.